Recognizing the potential of fuel cell technology, Singapore is pursuing the fuel cell research and deployment aggressively. The attractiveness of the fuel cell technology lies in its huge potential for wide applications, energy efficiency and environment friendly properties. In Singapore many institutes and government are taking various initiatives for the development and faster deployment of fuel cell technology in the country. For instance, in 2010 new Maritime Fuel Cell Research initiative has been launched by the Maritime and Port Authority of Singapore (MPA) in collaboration with Temasek Polytechnic (TP). BY conducting research and development into clean technology, Singapore is significantly contributing to its economy growth. Goldstein Research analyst forecast the Singapore fuel cells market to grow at a CAGR of 18.1% during the forecast period 2016-2024. Further, the market is anticipated to reach USD 58.9 Million by the end of forecast period. The report covers the present ground scenario and the future growth prospects of the Singapore fuel cells market for 2016-2024 along with the total revenue of fuel cell industry in every region. We calculated the market size and revenue share on the basis of revenue generated per segment and region on country level. The revenue forecast is given on the basis of number of fuel cell manufacturers and current growth rate of the market. Based on applications, stationary application accounted for the largest market share of 45% in 2016, while transportation segment is anticipated to be the fastest growing segment over the forecast period attributed to rising adoption of fuel cell technology in public transports and passenger cars. Singapore fuel cells Market Outlook 2016-2024, has been prepared based on an in-depth market analysis from industry experts. 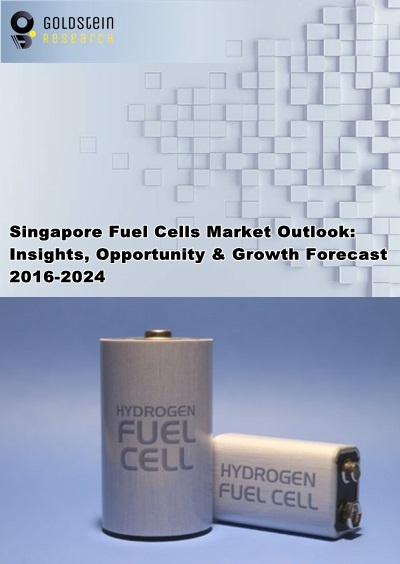 The report covers the competitive landscape and current position of major players in the Singapore fuel cell market. The report also includes porter’s five force model, SWOT analysis, company profiling, business strategies of market players and their business models. Singapore fuel cells market report also recognizes value chain analysis to understand the cost differentiation to provide competitive advantage to the existing and new entry players. Our Singapore fuel cells market report comprises of the following companies as the key players in the Singapore fuel cells market: Horizon Fuel Cell Technologies, HES Energy Systems, EFOY Fuel Cells, Toshiba, SFC Energy, SolidPower GmbH, Hydrogenic Corporation, Nuvera Fuel Cells, United Technologies, AFC Energy PlC, Fuel Cell Energy, Ballard Power Systems and Bloom Energy. According to our Singapore fuel cells market study on the basis of extensive primary and secondary research, one major trend in the market is strategic partnership to strengthen the market growth. The Singapore fuel cell industry is likely to witness public-private partnerships which are anticipated to be critical for attaining an economically viable technological shift. According to the report, major driver in Singapore fuel cells market is rapid adoption of fuel cell technology for various applications such stationary power backup units and portable power banks for individual consumers. Additionally, fuel cell applications include personal electronics, portable products and consumer products such as laptops, mobile phones and other devices are expected to drive the demand for portable power applications. Further, the report states that one challenge in Singapore fuel cells market is the high cost of fuel cells which is the major factor hindering the growth of this innovative technology and its mass adoption.